Does American Express Have a Millennial Problem? Critics have suggested American Express is struggling to reach a new generation of consumers, but it's not like the giant credit card company doesn't have a plan to get back on track. Though the American Express Company (NYSE:AXP) has fallen on hard times as of late, it has almost nearly dug itself out of the hole it found itself in a couple of years ago when huge co-brand card retail partners, like Costco Wholesale and JetBlue Airways, abandoned AmEx for credit card competitors. In its most recently reported quarter, the company's adjusted revenue increased by a healthy 8% year over year and total loan growth grew an even more robust 11% over the prior year's quarter. Topping this off, American Express's 1.8% net write-off rate is still the best-in-class. On the back of these improving fundamentals, American Express's stock price has almost returned to its former highs as well. 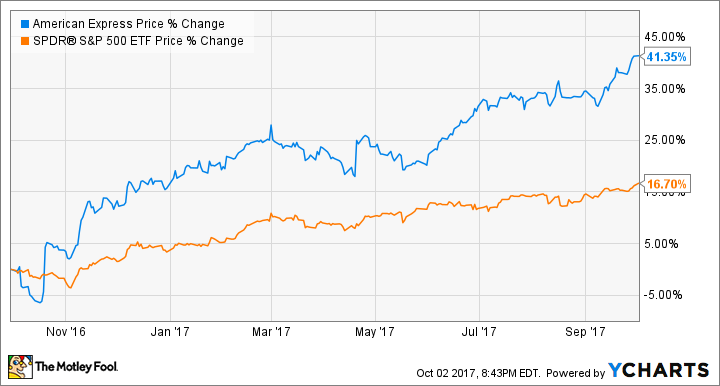 In the past year, the stock has followed its improving fundamentals and has climbed more than 40%, easily outpacing the S&P 500's 16% gains during that same time period. Of course, none of this means American Express investors don't face their share of concerns. Chief among these concerns are whether American Express products appeal to up-and-coming millennials. Earlier this year, a New York Times piece suggested that AmEx was having a hard time competing with rivals, like JPMorgan Chase's (NYSE:JPM) Sapphire Reserve, for young professionals' wallet space. It doesn't help that recent studies show that a surprisingly large number of millennials don't carry credit cards, making the few who carry cards all that more valuable. [W]e feel really good about our track record of attracting millennials to the franchise. We feel really good about the range of things we do using our unique assets to appeal to millennials. The last thing I'd say though, whether you're a millennial or a baby boomer or in any cohort, we are, however, about building long-term customer relationships. And we build products. We build value propositions ... So look, you can never do enough in this area, so we're focused everyday on trying to do better. But I think our track record with millennials is strong, and I think our ability to leverage our unique assets is strong. Let's take a closer look at the steps Campbell refers to and whether American Express's appeal to millennials is real or exaggerated. American Express might be struggling to gain millennial customers now, but the company believes it knows the formula to start winning this crucial demographic. Image source: Pixabay. Surveys show that consumers are increasingly looking at the rewards different credit cards offer before choosing. For this reason, American Express has spent increasing amounts on offering more differentiated reward categories than its competitors. In the second quarter, the company's card member reward expenses increased 9% year over year to $1.9 billion. Admittedly, a lot of these rewards are aimed at travelers, regardless of age, like free luggage perks with airlines and an impressive network of airport lounges. However, some newer reward categories are aimed squarely at the millennial. In this year's first quarter, for instance, AmEx rolled out Uber benefits for Platinum card holders. This past August, American Express released a new mobile payment plan feature the company dubbed "Pay It Plan It". The Pay It feature allows card holders to select smaller purchases, like a cup of coffee, and immediately pay the charge from their bank account. The Plan It feature allows consumers to select up to ten purchases over $100 and schedule a no-interest payment plan for these purchases separate from the rest of their revolving balance. These plans can be scheduled for anywhere from three to 24 months and card holders are shown how much their fixed payments will be before having to choose. Many believe these plans are geared toward budget-conscious millennial consumers who are saddled with student debt and wary of credit cards after seeing their families struggle with debt through the great recession. This theory makes sense. As noted above, many millennials do not even carry credit cards and millennials are undoubtedly saddled with more student loan debt than any other demographic. Finally, American Express is focusing with laser-like intensity on acquiring new customers through digital channels, a strategy that, thus far, seems enormously effective in gaining new millennial customers. In the second-quarter conference call, Campbell justifiably bragged about the company's "card acquisition engine that has successfully been redesigned for the digital age and a more agile technology infrastructure that brings customized products and services to market more quickly and efficiently." The results speak for themselves. In the same conference call, Campbell stated that two-thirds of all new customer acquisitions came via digital channels and approximately 35% of all new customers were millennials. So does American Express have a problem with millennials? Maybe. Companies always struggle with reaching new generations and it might take a little time for AmEx to calibrate its marketing and products to best reach America's young professionals. There is no doubt that they, like the generations that have come before them, have different tastes and values than preceding generations. But there does not seem to be any evidence that this isn't a problem that American Express can't fix or, indeed, may have already fixed. Coupled with the company's recovering growth, safe and growing dividend, and industry-leading customer satisfaction marks, American Express is a company investors shouldn't hesitate to consider for a well-diversified portfolio.